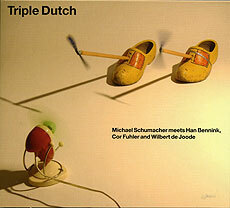 Michael Schumacher, dance in duo with: Han Bennink, percussion; Cor Fuhler, piano; Wilbert de Joode, double bass. DVD recorded at the Holland Dance Festival, Korzo Theater, The Hague in November 2003. Cover artwork (reproduced above) by Han Bennink; photograph by Pieter Boersma.